Looking for a Used ATS-V in your area? CarGurus has 95 nationwide ATS-V listings starting at $31,811. 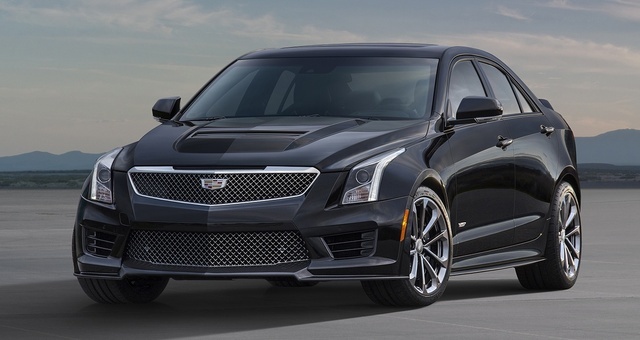 Cadillac’s brand new addition to the ATS family, the high-performance ATS-V, is set to debut for the 2016 model year. Spicing up the already posh and potent ATS brand, the V will come in compact sedan and compact coupe iterations. (The ATS-V Coupe is covered separately.) Curiously, although the 4-door version offers seating for 5, and the 2-door variant boasts 4-passenger seating, the 2-door is actually a tad longer and wider than its 4-door counterpart. 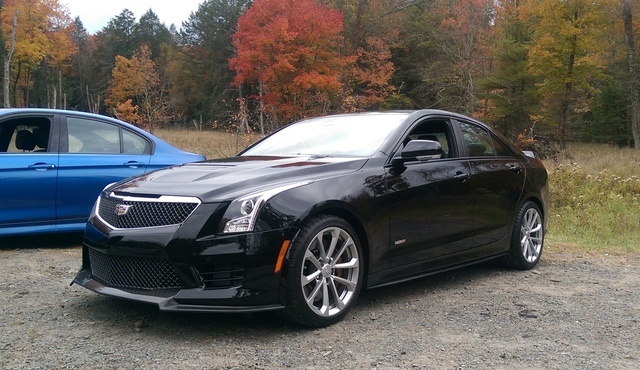 In any case, the V-Series ATS will, like its CTS-V cousin, carry virtually all the luxury appointments that adorn its lesser counterpart, with all of these complemented by a slew of extra performance-oriented features. In the case of the ATS-V, this plus-size sportiness comes in the form of an adaptable sport-tuned suspension and standard summer performance tires, along with a 3.6-liter twin-turbocharged V6 engine that can be mated with a pair of transmission offerings. Look for 455 hp and 445 lb-ft of torque out of this potent 6-cylinder powerplant when it’s combined with either the standard 8-speed shiftable automatic transmission or the available 6-speed manual shifter. The latter gearbox, by the way, features a unique “no-lift” function that allows you to rip through upshifts and downshifts without lifting your foot from the gas pedal. Cadillac touts this force-fed V6 to have its ATS-V editions screaming from 0-60 in 4 seconds flat, with a top end of 185 mph, but don’t expect to see EPA-estimated mileage numbers for a while yet. It is confirmed, however, that this super scooter will burn only Premium unleaded and will be delivered only with rear-wheel drive (RWD). In any case, all this turbocharged grunt has inspired the folks at GM’s high-end Cadillac barn to install a unique standard audio/video recording system, dedicated to documenting your performance at the local grand prix layout, installed in each ATS-V. Meanwhile, distinctive appearance bling the 2016 ATS-V is slated to bring to the table includes a carbon fiber hood, front splitter, and standard rear spoiler, as well as 18-inch alloy wheels with performance tires and a standard power sunroof. Inside, look for carbon fiber accent materials and genuine wood trim to give this high-performance commuter a hand-crafted ambiance as it embraces power-adjustable leather-trimmed Recaro sport front seats, full power accessories, and steering-wheel-mounted titanium paddle shifters (automatic transmission only). Like its less dramatic ATS underling, the debuting 2016 ATS-V will doubtless offer such expected cabin bling as cruise control, telescoping tilt-wheel steering, and standard Bluetooth-interfaced CUE (Cadillac User Experience) infotainment technology, along with a rear-view camera, front and rear parking sensors, and dual-zone auto climate control. Furthermore, look for this brand-new Caddy V-Series scooter to offer Bose premium audio components boasting satellite radio, 7 speakers, and a memory-card slot. A hard-drive-based navigation system, meantime, as well as upgraded audio and improvements to standard exterior and interior bling are expected options, though available equipment offerings are, at best, speculative. It is certain, however, that each 2016 ATS-V will include the usual 4-wheel antilock braking system (ABS) bolstered by high-performance Brembo brakes as part of the standard safety equipment aboard. Further safety stuff will include front side-mounted airbags, front and rear head airbags, turn-signal-integrated mirrors, daytime running lights, a post-collision safety system, and OnStar/CUE emergency telematics. Additionally, look for a standard head-up display, as well as a pair of optional safety packages offering blind-spot warnings, lane-keeping assist, adaptive cruise control, forward-collision warning with collision-mitigating brake sensors, and rear side-mounted airbags. What's your take on the 2016 Cadillac ATS-V? Have you driven a 2016 Cadillac ATS-V?